Thanks for reminding me (placing camera in bag). I've read the setup procedures a couple of times, but I learn by doing. Strongly agree with MN3. Would document the setup process in detail. Had a ARC 21 shipped to me and had to have a few conversations with the people at Aquarius Sailing (thankfully they are still in business) to finally get it set up correctly. dssaak Resale ??? I have never bought a boat I thought I wouldn't keep. That is likely why I am up to 5 now. Only Pete (I see he is on right now) is more of a collector than I am. F16 - 240lbs ... best of all worlds if you are not into One Design racing. I drove 6 hrs to get my F16 and it was well worth the trip. Best boat I have every owned. Missed this yesterday Dan. When collecting the number of boats WE have, resale plays into the decision. I don't think that we have purchased a boat that we could not at least break even with.I keep saying we should stick to a couple of like boats but it is too much fun to play with the different ones available. Just saw that H21 in Hartford. Anyone up for a short road trip? If it is not junk it will probably end up in the cat shed soon. We took lots of pictures, and I set it up and tore it down. I need to set it up again soon, before the memories fade, and I think I'll have it. There is one thing I didn't set up though. It looks like there are a pair of extra cleats for positive mast rotation. Have you seen any pictures showing how to rig it? Is it just a line from the mast rotator over to each cleat on the beam? Agreed. I wouldn't mind if the pictures were a bit higher res though, but it's still good. Pete, yes to all of the above. There is no EPL football this weekend so I can take a ride if you want me. Ted is the one you NEED along as he knows that boat model inside out. It would be a great addition for you. I think I may be the poster boy for boat diversity; three different cats, one tri and a mono. You know my boats and I consider them all "value" buys but that still doesn't mean I want to sell them. I am even considering pulling down the Tiger ad but don't tell the wife. So, I've had the C2 for about a year now, and am loving it. It takes a bit longer to set up than the H18 did, but I've never once regretted getting it. My wife loves it also. This really helps, considering it cost a few $$. Goodall did a nice job on the controls and design overall. The hull design makes it hard to bury them, although I have managed to do it, up to the front cross-bar, with the spin up. That brought me to a screeching halt. Lesson learned - keep weight back a bit more on the down wind. It's a fast boat, and it points well. The only oddity I've noticed is that the boat "hums" at high speed (didn't have a speed puck, so don't know exactly how fast). Wasn't able to locate source of vibration. My crew thought it was cool. To him, it meant it was time to get on the wire. The engineer in me started wondering what was vibrating, and whether I should do anything about it. So, I've worked the edges of the rudders a little, and tightened the tension arms to reduce side-play when down. Will find out next weekend if this makes any difference. Thanks everyone for the advice and good discussion. This is a great forum! Quote I've had the C2 for about a year now, and am loving it. It takes a bit longer to set up than the H18 did, but I've never once regretted getting it. My wife loves it also. This really helps, considering it cost a few $$. I crew on a C2 and on an Infusion prior. Both boats "hummed" (perhaps more of a whistle) at high speed. There is so much going on and I am no expert, but I took it as humming from the rig not boards as I notice the pitch change as apparent wind builds or bleeds off from turning down. Could be wrong, but I have heard foiling boats with the same sound as they approach 20 knots. It's in the boards and rudders. We faired the boards on a foiling boat and the noise/vibrations went away. Most of the F18's are a touch thick at the back of the rudder and need a sanding to get them razor sharp. samc99us It's in the boards and rudders. We faired the boards on a foiling boat and the noise/vibrations went away. I've heard that while sharpening the back of the blades is desirable, the focus is to sharpen while keeping the edge asymmetric. Symmetric sharpening will aid harmonic vibration. Any input? Note: During a particularly nasty stuff while hooking up to go out, I reached out to stop myself with the closest thing I could brace against...the daggerboard. Missed with my hand, but not with my forearm. Moral of the story? Be careful what you sharpen. Also, the trailing edge of C2 boards are notoriously brittle. I'd be cautious to thin them out too much. I worked the edges down like a chisel, on the inside, as per the manual. I didn't do the dagger boards though, as they look fairly thin. We file symmetrically; asymmetric fairing changes the foil from a symmetric shape to an assymetric shape and is technically against F18 class rules though no one would protest it on a trailing edge. I agree that going too thin on the TE is risky and the boards are a little brittle there. The real keeper is the vertical scratches on the daggerboards, those need to be eliminated whenever possible. On the stuffs, I like Nacra's solution of cutting back the part of the trailing edge that sits in the trunk so when it stick above the deck danger is greatly reduced. A sailing buddy was airlifted off a Nacra 20 when slamming into the back of the board in big breeze and needed a number of stitches to his leg, so it is a real risk. Use chicken lines!!! What would be the advantage of filing asymmetrically? This is what the Goodall manual shows, but I'd like to understand why. The fact that the manual states that the bevels on both rudders should face each other makes it sound like there is some interaction between the two. Is that true? It has to do with vortex shedding (you can do a wikipedia search). A true fluid mechanics guy/gal can correct me, but my understanding is this: Vortexes shed off blades/foils at any speed, generally alternating off one side, then the other. However, with our super-stiff CF foils, at a certain boat speed you hit a self-energizing resonant frequency where the vortex shedding interacts with the trailing edge making it flex in resonance and you can hear this as hum. 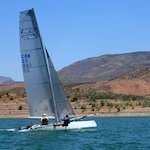 By filing the edges asymmetrically, you destroy the balance (or at least shift it to a different speed outside your normal sailing range). You still want to keep that trailing edge as fine as practical to support clean separation and minimize drag. The asymmetric chisel shape (6) is given a worse value than the symmetric point (5), but sharpening the angle and radiusing the edge (7, 8) improve that value. However, one of the yacht designers chimed in that an asymmetric chisel shape was better for high speed craft. Edited by ropewalker on Jan 27, 2019 - 11:41 PM. Very interesting table. I wonder how that varies as a function of water velocity and angle of attack... Anyway, will keep #7 and 8 in mind the next time I fair my edges. I saw your post on Catsailor about rudder slop. Did you ever solve it? My Prindle 19 makes the same kind of noises when approaching 15 kts. I went out this past weekend and heard the vibration once, briefly, around 14kts. It didn't last long, and didn't happen again the next time I got to the same speed. So, there's a resonance there, and I've narrowed the conditions that excite it, but didn't completely eliminate it. A fellow sailor recommended patching a couple of nicks in the rudders. I may be in the region of diminishing returns. Oh yeah, I bought a speed puck. Edited by ropewalker on Feb 12, 2019 - 10:45 PM.